Frequently asked questions, by WVWA customers, about lead in drinking water. Is there lead in my water from West View Water Authority? Testing shows that lead is not present in West View Water Authority’s source water, the Ohio River, or the treated drinking water leaving our water treatment plant. Then how does lead get into my drinking water? Lead in drinking water comes from lead water service lines, lead water lines inside of your home and/or lead used in household plumbing materials. Homes built before 1930 are more likely to have leaded plumbing systems. In addition, if your home was built before 1986 you may be at risk for lead contamination from both plumbing fixtures and lead solder. What part of my water service lines are owned by me and what part are owned by West View Water Authority? 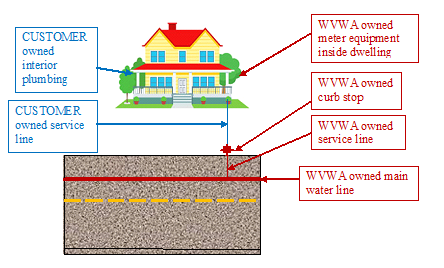 West View Water Authority owns and maintains the main water line on your street, the service line from the main to the curb stop and the curb stop. The customer owns and maintains from the curb stop to the entrance of the dwelling as well as all interior plumbing. In addition, West View Water Authority maintains the meter equipment inside the property. All other interior plumbing and lines are the property owner’s responsibility. 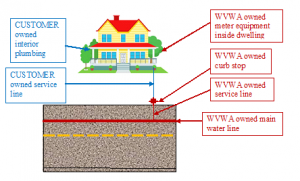 Any part of the service line, whether customer owned or WVWA owned, could contain lead lines. How do I know if any of my West View Water Authority service line is lead? You can call us at (412) 931-3292. We can share with you the information we have regarding your West View Water service line information. How can I check for lead lines in my home? Lead service lines are generally a dull gray color and are very soft. You can identify them easily by carefully scratching them with a key. 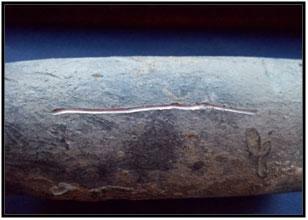 If the pipe is made of lead, the area you’ve scratched will turn a bright silver color. Do not use a knife or other sharp instrument and take care not to puncture a hole in the pipe. 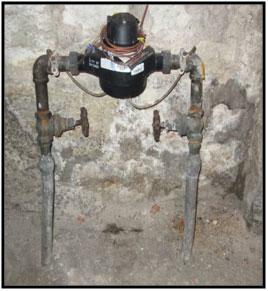 Lead service lines can be connected to the residential plumbing using solder and have a characteristic solder “bulb” at the end, a compression fitting, ot other connector made of galvanized iron or brass/bronze. Lead service lines often end just inside the front or side wall of the home, but may extend further into the building as shown, where the lead service line comes out of the basement floor to the water meter and then back into the floor, continuing further into the building. 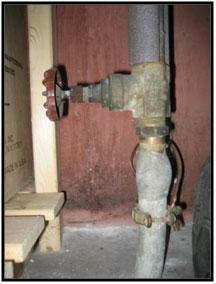 If you are still unsure of what your customer owned water service line is, we advise you to contact your plumber. I have a section or all lead water service line, now what? Flush your cold water tap before using it for drinking or cooking. This is especially important if the water has sat in your house plumbing undisturbed for several hours. The longer the water lies dormant in your home’s plumbing, the more lead it might contain. We recommend holding your finger under the tap until you feel a temperature change. You want to make sure that you are consuming water from our main line out in the street, not the water that has been sitting in your lines. Do not drink or cook with water from your hot water faucet. Hot water has the potential to contain more lead than cold water. Boiling water does not get rid of lead. You are better off using cold water straight from your faucet. Do not try to boil your water to remove trace amounts of lead. Check for electrical grounding to your plumbing. If grounding wires from electrical systems are attached to household plumbing, corrosion and lead exposure may be greater. You may need to hire an electrician to check your house wiring. Should I buy a filter for my water? West View Water Authority takes the required steps to reduce the potential for lead to leach from your pipes into the water. Buying a home treatment device is a personal decision. If you feel that is the best route for you and your family, be sure to research products. Consult the device manufacture to make sure that you are purchasing a system that is designed to remove lead. Should I have my water tested for lead? We always believe that the more you know the better you are at protecting your health. West View Water Authority strives to provide you the highest quality drinking water, going above and beyond EPA and DEP standards. If your house is served by a lead service line or contains lead plumbing or household materials, you may consider having your water tested. If you are pregnant or have children living in your home, be sure to follow our recommended steps bulleted above to reduce exposure to lead. Following those steps can drastically reduce your potential exposure. Young children, infants, and fetuses are particularly vulnerable to lead because the physical and behavioral effects of lead occur at lower exposure levels in children than in adults. You cannot see, taste or smell lead dissolved in water, testing is the only way of knowing the content in your water. Currently, West View Water Authority does not provide random testing for lead for individual customers, however, if you have a lead service line and would like to be added to our list for the 2019 Lead Sampling Program, call us at 412-931-3292 ext. 3220. We are always seeking out volunteers to submit lead and copper samples during our required sampling period. If you are still concerned about lead in your drinking water and would like testing completed now, there are several certified labs that provide lead testing for a fee. You can call our lab at 412-931-3292, ext. 3220, the Allegheny County Health Department at 412-687-ACHD (2243), or the Environmental Protection Agency’s Safe Drinking water Act Hotline at 1-800-426-4791 for a list of recommend and/or certified labs. I do not have a lead service line and my house was built after 1986. Am I still at risk for lead contamination in my water? You are not considered at risk for lead contamination to your drinking water. Over the years, new regulations, new materials and new manufacturing procedures changed the industry by reducing the lead content in both plumbing fixtures and solder. With the new regulations, the term lead free mandates new materials contain no more than 0.25 percent lead content. Are there any other ways I can be affected by lead? We are susceptible to lead exposure from the air, soil, consumer products, food, and occupational settings. The major source of lead exposure among US children is lead based paint and lead contaminated dust in deteriorating buildings. For more information please visit the Center for Disease and Control website @ www.cdc.gov. I still have questions about lead in my drinking water and my water quality. Where can I get more information? We encourage you to view the Water Analysis Sheet and our Consumer Confidence Report on our West View Water Authority website. These reports verify the quality of water that we provide, along with the tests results that we run each year. If you still have questions or would like to discuss any of the information provided on this FAQ webpage, please feel free to contact the West View Water Authority lab at 412-931-3292 ext. 3220, Monday – Friday 8:00 – 4:30.